Most travelers looking for an endorphin rush in Arenal try zip-lining or waterfall rappelling, but then they get to Lake Arenal and settle for paddling in a Kayak. Meanwhile the real excitement on the lake speeds past on a wakeboard. 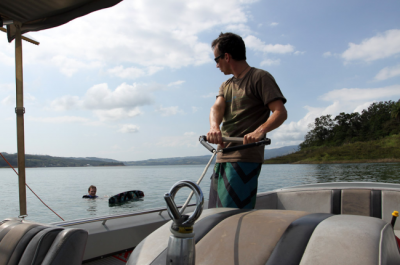 Watersports like wakeboarding are the biggest adrenalin rush on Lake Arenal and for those who haven’t tried it, there’s no better place to start: few boats, warm waters, and stunning landscapes. Sander Werink couldn’t agree more. He traded his life in Holland for Lake Arenal’s endless summers where he’s managed his own wakeboarding and watersports company for the last five years. He’s one of the first people to bring wakeboarding to Costa Rica and runs the only proper school in the country. I spent the day riding with him and his friend Gabriel, trying out their different boards and getting some pointers on my technique. I remember this bit from wakeboarding in my childhood: Once you’re in the water keep the board parallel to the boat, knees bent and a tight grip on the handle. Let the boat do all the work. As you feel the pull on the handle, turn the board with your best foot forward. Much like riding a bike, wakeboarding is something you never forget and after 10 years without practice, I got up on my first try – to me it’s still one of the most gratifying experiences. For beginners, a few false starts and a little advice is all it takes to get up on the board. After getting comfortable with riding, it’s time to jump the wake (that’s the wave behind the boat). First, you move to the far left or right side of the boat. Then you cut back in, hit the wake and sail into the air… and flail face first into the water. Okay, so I’m better at getting up than jumping, but that’s what I came to learn. As the boat came back around to pick me up, Sander was ready to give me a lesson. He stood on the back of the boat holding his own rope and handle to demonstrate the position I needed to jump. Explaining slowly and deliberately, he told me to keep my knees bent and the handle close to my chest to have more control. After showing improvement on my next run, he taught me to pull toward the wake using the rope and to jump stretching my body straight while keeping the handle low near my waist to maintain control and get maximum air. On my next attempt, I really did sail through the air… and I managed to land without falling. I tried a few more times each with growing success and by the end of my run I was jumping at least 6 feet high. Exhausted, I settled down in the boat to watch Sander, a 15-year-wakeboarding veteran. On his first try, he launched easily fifteen feet in the air and sailed over the opposite wake on the far side of the boat. He followed that trick with a back flip and then moved onto somersaults, flips, twists, grabs and spins. It was like watching the X-games, like having my own private demo. Incredible. Besides the wakeboard, Sander has a wakeskate – a hybrid skateboard and wakeboard with no boots to strap you onto the board. There’s a lot more freedom on the wakeskate to try tricks like pop shove-its and kick-flips, but it’s little more difficult to control. Gabriel, a talented skateboarder, tried it out first. After a few failed shots at pop shove-its, he tried jumping the wake. He hit it with good speed, got some good air then flew off in one direction while the board flew off in another. Another hybrid, the wakesurf board combines the size of a wakeboard with the shape of a surfboard. The goal is to ride the wake on the back of the boat without using the rope. The three of us each took turns. We found that although it was easy to ride the wakesurf board, it’s hard to ride the wave without the rope. It was still a lot of fun though, riding the wave with the rope, cutting back and forth into the wave pretending you’re a pro surfer. I can’t imagine a better way to enjoy Lake Arenal than riding across its calm, glassy surface on a wakeboard. It’s the breeze, the sun’s reflection, the endorphins, the feeling of the water rushing beneath your legs as you carve over the wake and look back at Arenal volcano. Error: Error validating access token: Session has expired on Friday, 23-Nov-18 07:34:26 PST. The current time is Friday, 19-Apr-19 02:24:33 PDT.